The Verizon Droid Support page has been updated to show the official Froyo build which will hit our devices next week some time. FRG01B is what we can expect. 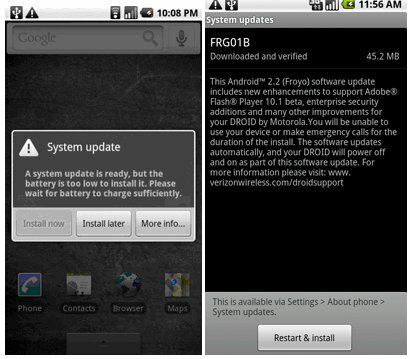 A 45.2MB download that will bring the Droid 1 ahead of the newest family member, the Droid X.
FRG01B look familiar? That’s because the last build to leak was FRG01, so they must have tightened up a couple of additional bugs before pressing go.